Ya'alon has begun to promote the legislation to approve El-Matan as part of the Ma'ale Shomron municipality. 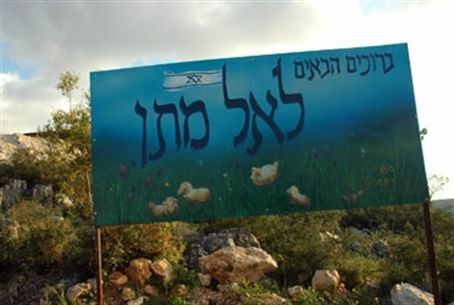 Defense Minister Moshe (Bogie) Ya'alon (Likud) has ordered the promotion of the legislation planned by El-Matan to become part of the municipality of Ma'ale Shomron, as well as a tourist attraction. El Matan, found in Samaria, was established in 2001 by residents of nearby towns on the Nahal Kaneh Nature reserve. It is considered an unauthorized outpost by the Israeli government, despite an ongoing campaign to gain legal status. Ya'alon also ordered an immediate approval of the expansion of the access road to El-Matan, so that the road will be wider, safer, and have greater security. The Minister's order comes days after a terrorist attack which occurred on the service road between Ma'ale Shomron and El-Matan. Terrorists firebombed a car driven by Avner Shapira. He and his 11-year-old daughter, Ayala, were wounded in the attack - Ayala critically. She has been hospitalized at Tel Hashomer Hospital since Thursday night. On Sunday, the acting Chairman of the Samaria Regional Council, Yossi Dagan; Chairman of Ma'ale Shomron Council, Lior Mekaiten; and Chairman of El-Matan, Daganit Pesach turned to Ya'alon and Prime Minister Binyamin Netanyahu requesting them to arrange the certificate to legalize El-Matan. "The attack over the weekend happened after a long series of similar incidents including stone-throwing and fire-bombing at the same point in recent months," they wrote. "The ease with which Avner and Ayala Shapira were struck illustrates the lack of safety and security of the road connecting Ma'ale Shomron with El-Matan." "Therefore, we demand a solution to the problem which will allow residents to travel home safely," they Chairmans added. The three also sought to definitively confirm the certification of legality for El-Matan. "El Matan was established in 2001 on state land of the community Ma'ale Shomron, within the blue line. The approval of El-Matan's legality is in its final stages. As soon as it is approved, it will be possible to build an access road that is much safer." "Therefore, we require the final approval of the certificate to legalize El-Matan, thereby providing the community with proper infrastructure and a safe road with two lanes and a correct visual field along the entire route," they concluded.